Good Morning Nick, just wanted to let you know I received the speaker Friday and it definitely exceeds my expectations in maintaining its originality. Thank you very much for the fine craftsmanship. I will be one of your repeat customers in the future, Mike. (Stromberg Carlson 8 inch, May 2015). Greetings Nick - I finished putting my Atwater Kent F-4 speaker back together early this morning and thought you might like to see it. The green on the front metal grid is not the original color, but that's what I wanted. 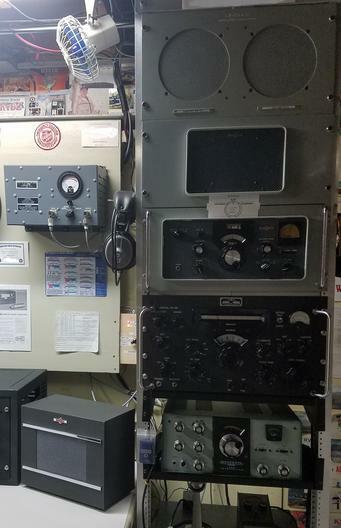 Now if I can just get the radio restored! It will take a long while because there is a lot of work to do. Thanks you so much for your excellent work on the speaker! Best, Dave H.
Just an FYI...your service is excellent....the speaker worked flawlessly. 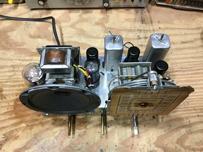 Attached is a couple photos of completed radio restoration. David B. The speaker arrived today and worked perfectly! Thanks, Nick! Thanks again for the good work, I referred you to a couple of other collectors that asked me who did the work when they saw the pics...thanks again, Bill A. 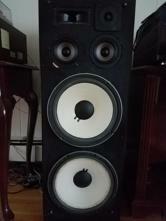 My "thank-you" is way over due , the 2- Zenith 12A58 speakers, that you repaired are JUST PREFECT , both sounds and appearence ! After installing an MP3 / stereo jack on a remote cord, not to drill holes in the chassis , I listened to truely great music today ,coming from my CD player, through your "handy work" ! I though you would like to see the email I sent Paul , currently making plans to pick up his radio ! Thanks for the "heads-up" , I listened to your "lady sing", all day today, with the tuner input on AM ( yes the SW works, as well ), and a CD input into the stereo jack, " THAT LADY JUST ROARS " ! I have to send a big "thanks-you" in Nick's direction ( from the Speaker Shop ) , he truely does, GREAT WORK ! Lee, Joliet,IL. 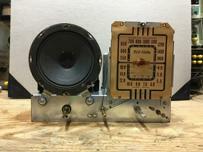 You will be the only vender, for my speaker repair needs in the future Lee , Joliet IL. Just want to let you know how pleased I am with your recent repair of my woofer. Sounds GREAT. And I'm sure I'll be calling on you again. Just wanted to let you know that the 'Cube is great! Thanks for the wonderful customer service provided by you and your family. . . . I've been telling everyone that asks me where to buy speakers to come to your store, I know I'll never deal anywhere else again! <?xml:namespace prefix = o ns = "urn:schemas-microsoft-com:office:office" />Once again thanks for the wonderful service that you and your family provided, you have a customer for life now! Thanks for all your help and your quick responses to my emails! I was impressed with your company when we first bought the system a number of years ago, and I continue to be impressed! from the people to the price and quality. I would recommend this company to all, they impressed me not just price but delivered to my front door in 3 days. I will be looking for any products I buy from this company first. Thank you very much for the price, quality and the free stands. 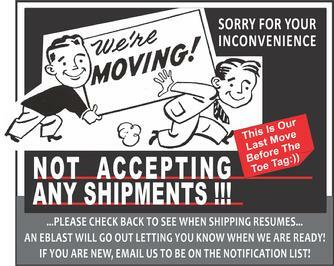 Best company I have dealt with since I started buying online � �. Everything works wonderfully together. I can't believe how easy it is to set up the remote. Thanks for everything; and, be assured that I'll be back for any future needs. 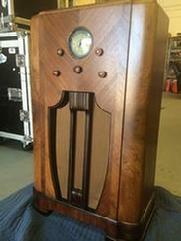 Nick:� The speaker arrived in great shape and yes, it is functioning great.� Now if I can make an antennae that will pick up local stations - we live in a pretty rural area.� Thanks for your great work - it's great to hear that good bass sound.� Bob. (Atwater Kent , April 2017) Thanks again - sure, you can use my "testimonial".� The speaker certainly has the look and (I'm sure) the sound of the original.� What a professional job to restore the speaker.� Have a great weekend - Bob. Nick... The tweeters arrived today and I have installed them in my Wurlitzer 3000. They sound great! Thank you very much for the repair, Steve (Wurlitzer 3000 Tweeters Dec 2016). Got back my 2 mid-ranges and one woofer for my AR12's. They sound as good as ever ! Its good to know these speakers can now live on and its nice to know that if they need more maintenance in the future, I have a go to professional like you. Thanks !! Elliot C.
Hi Nick,here is a pic of the 1936 Rickenbacher (note the correct early spelling) "lunch pail amp" with the original 10" Rola speaker that you reconed back when you were in Ohio. Since the repair I have been playing this for years with It's matching Rickenbacher Electro Spanish guitar. Thanks again, Marty. Well, you have out done yourself! 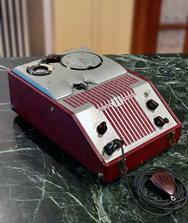 Right now I am listening to the Zenith 5-S-228 with the speaker. 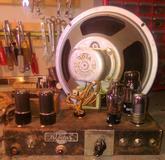 It sounds far better then most radios I have restored. It has a 6F6 audio output tube, not push pull, just a single 6F6 and I believe your speaker is reproducing every ounce of the tone quality it has - perfectly. 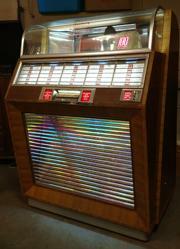 I have my iPhone plugged into the phono jack on the radio and it is playing Glenn Miller - Danny Boy. My goodness it sounds good. 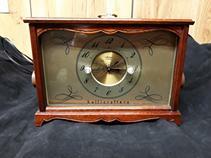 I have decided to sell this one to fund some of my other Radio habits. :):) I will mention The Speaker Shop's work when I list the item. I wish you could hear it. Wow!! Incredible! Looks brand new and sounds GREAT. 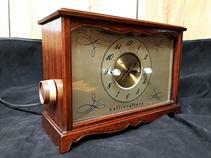 The "golden throat" sound of RCA Victor is reborn. Approximately 4 weeks ago, I called your business, trying to find a replacement driver for my NHT 1.1 center channel speaker. You did not have them for sale, but you suggested that repair of the speaker could be done at The Speaker Shop in Ohio. I corresponded with "Nick" at that business, and eventually sent my driver. It was repaired, and I replaced the speaker in my Audio/Visual system, and am very heppy with the repair and the continued use of my NHT speaker. Thank you for your reference It was a good one..
Hello Nick at the Speakershop. I got the Jensen back and hooked it up - it sounds great! Thanks a ton. Happy Holidays- Philip L.
Drivers were received and they look factory perfect. Nice Job and on time too. You will be getting more orders. 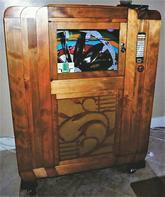 ".....Here's a 1948 McKinney amp made by Valco in Chicago. This is the same as a Supro Supreme of the same era with the single volume control and 6J7 input tube. Other tubes are 6SC7, (2) 6V6GT, and 5Y3. Speaker is the 10" field-coil Rola (pro-reconed by Nick at the Speaker Shop). Demo is done with a parts Stratocaster with Don Mare pickups, then a Les Paul with P90 pickups. Amp was set to about 80% volume. The rear of the amp is shown at the end of the video..."
1. I redrew the complete dial by hand in Microsoft Paint as a .jpg image. I logged the time and it took me 19 hours to complete. It looks identical to the old one. 2. All tubes were tested and 3 weak ones replaced with vintage originals. All tube sockets were tediously cleaned and checked for good continuity. 3. All suspect resistors and capacitors were replaced. 4. All tube plate caps have been replaced with new ceramic types and rewiring done as necessary. I bought 4 different colors of 18 AWG cloth wire on eBay to do the rewiring. 5. All tube shields have been taken down with steel wool and repainted in chrome finish paint. 6. Original RCA internal chassis labels were taped off and protected as shown in photos. 7. Rear serial number plate and front panel control plates were brushed and polished. 8. The power cord was replaced with a NOS cloth-covered replacement from the 30's obtained on eBay. 9. All RF and IF cans were removed, polished and replaced. New rubber grommets were replaced for all wirefeed-throughs. 10. With chassis stripped of all main components, unit was sprayed down (top and bottom) with component cleaner/lubricant, allowed to drip for 2 days and then dry out for 3 weeks. All necessary chassis components were lubricated as needed. 11. With chassis complete a full electrical test and alignment was done. 12. Chassis was then hand painted with silver paint. All screw heads and miscellaneous components also painted black or silver as required. 13. Dial mechanism and Vernier were completely disassembled, cleaned, rebuilt with a replacement main gear and lubricated to return the main and secondary pointers back to smooth working operation. Pointers were re-painted black. Light bulb sockets were cleaned and polished. Dial housing was also painted silver. Dial scale was printed on vellum and affixed with the original standoffs and some white glue to hold it in place. 14. 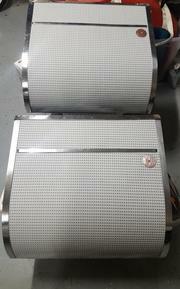 Speaker was sent to you for a complete professional rebuild of the voice coil and cone back to original. It works beautifully. 15. Front panel standby switch was replaced with a vintage 30s unit. 16. New vintage-look knobs were added. 17. The cabinet and front panel were completely stripped and repainted with the correct black wrinkle finish. 18. The entire unit was re-assembled and tested ok on all bands and all functions. Thank you again for the great work on the speaker. It is by far, the pride and joy of my entire radio collection.I've got well over 100 hours of work and $300 of parts/material into it. 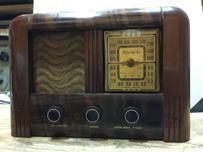 For a 74 year old radio; it looks pretty new. Just wanted to let you know I got the speaker yesterday and have installed it. It looks and sounds great! Thanks again! My speaker arrived today..I can not thank you and Nick,enough.The fabric used as part of the restoration, is perfect...In my opinion,it has the appearance of a material that is of the same era as the speaker,and radio,itself.Its' slight iridescence,gives the entire speaker a very refined, and visually balanced look. Nick did such a wonderful job, please thank him for me. 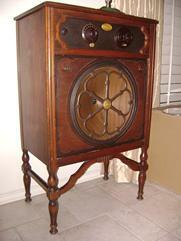 As this radio and speaker is on display in my living room, how it appears, is important to me. Once again, thank you for everything..
As always....Thank you! Your the greatest! I just wanted to take the time to express a sincere thank you for your patience, expert guidance, and quality installation on our new Home Theatre. As you will recall this has been a dream of mine for many years. A step above was what I was looking for, and it is everything I had dreamed it would be. . . .
. . . As you well know I have traveled all over North America, have seen countless concerts and live performances , as well as the latest and greatest films. The only thing I can say is now I can enjoy them in the comfort of my home. Again, Thank you for all of your help for the jaw-dropping setup that I now have. Received the two JBL woofers. They were in good shape. I have installed and played them. 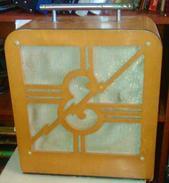 The Stratosphere speaker arrived back home safe and sound.. and quite beautiful!.. I hope it was not too much of a problem.. I will take some pictures and put it up on my web site (www.oldradios.com/strat) as an "After" photo, and provide a link to your web site. Thank you!.. Thanks for the follow up. Everything seems to be working fine and it sounds great. I appreciate you following up with me and I'll definitely keep you in mind for future purchases. Thanks again. Nick, got the re-creator today. beautiful. any of my radio friends that don't know about your shop will if they ask me. thank you nick for bringing the rola back to life. long after i'm gone someone will still enjoy it. after all that's what preservation is all about is'nt it nick. THANK YOU NICK, YOURS, GREG HILT. Just wanted to say thanks... The speaker looks original and sounds perfect!